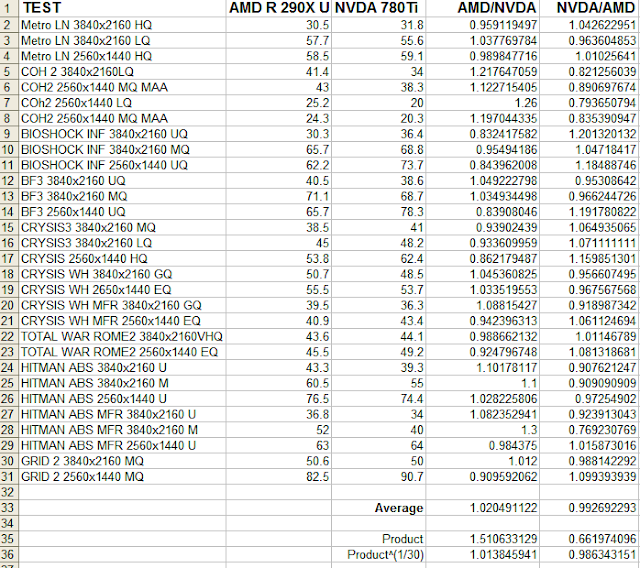 AnandTech has a Nvidia GeForce GTX 780 Ti Review by Ryan Smith, where he claimed to show the Nvidia card 11% faster than AMD's R9 290X. I didn't read how he did his arithmetic, but reading the graphs, it appears that AMD won most of the time. So I did an exercise of calculating the performance ratios of the two cards based on Mr. Smith's numbers of gaming performance. The result clearly shows that the AMD R9 290X (running at the 55% fan speed mode) is faster than the GTX 780 Ti by at least 1.4%. See the excel table below. I checked the data entry twice, correct me if you find any errors. The propaganda machine is hard at work. I pity those foolish enough to believe such non-sense.